The idea behind challenge coins can be traced to the times of the Roman Legion, when symbolic devices were presented to individual Legionnaires in recognition of service. They returned in the Twentieth Century. One history credits their resurrection to the Royal Air Force. Pilots and crew operating over Axis-occupied territory were provided gold coins. In the event pilot or crew was forced to land in enemy territory the coin or coins might prove useful in seeking indigenous support in evading capture. The RAF established social rules for its coins. If a RAF member entered a bar he was subject to challenge to establish his unit membership. If he produced his coin, the individual who issued the challenge would buy the challenged individual a drink. If he failed to produce his coin, he was obligated to buy each individual in the bar a drink. Challenge coins returned in World War II, many in custom version unique to individual U.S. Army and Air Corps units, more for esprit and morale than operational purposes. The challenge coin increased in popularity in the post-Viet Nam War era, initially by U.S. Army Special Forces. Traditionally a unit challenge coin is presented by the commanding officer upon a soldier's joining the unit or upon his or her successful tour of duty with the unit. A coin also may be presented to important or respected guests (the two to are not necessarily synonymous) of a command or organization. Today challenge coins exist for military units of each of the U.S. services (including Navy ships), the individual War Colleges, joint commands, civilian government agencies such as the Nuclear Regulatory Commission and the Bureau of Alcohol, Tobacco, and Firearms, and law enforcement, such as the Tuscaloosa, Alabama, police department, Federal Bureau of Investigation, and the Royal Canadian Mounted Police. In early years when the subject of challenge coins came up I heard Marines of all rank dismissively say “Marines don’t ‘do’ challenge coins”. In 1981 at their request I began offering to certain Special Operations Forces units a presentation on legal issues involved in planning and executing a special operations mission. Learning of it, in 1990 the Commanding General of what eventually became Marine Corps Special Operations Command requested I offer my presentation to his command. Upon its conclusion, he presented me with his command’s challenge coin, noting it was the first U.S. Special Operations command as his unit could be traced back to Marine Lieutenant Presley N. O'Bannon’s 1804 raid on Tripoli. Marine Security Guard detachments at U.S. embassies around the world have custom-designed challenge coins to sell to official visitors to finance the annual and popular Marine Corps Birthday Ball each embassy detachment is expected to host - Birthday Ball tickets do not fully cover the cost. 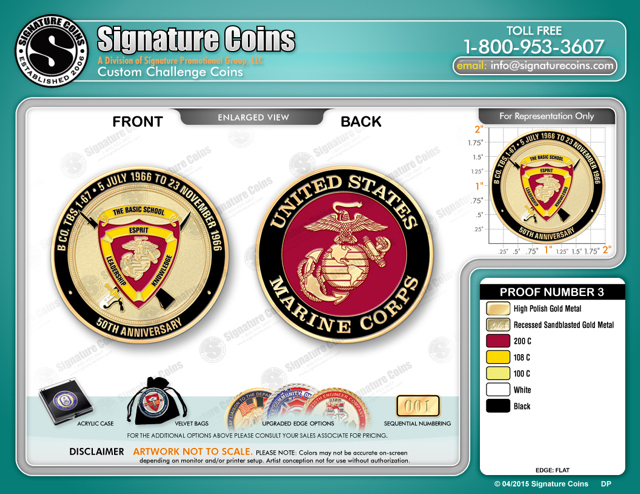 Challenge coins also have been created to commemorate a major event in a unit’s history. This was the basis for creation of a coin for the fiftieth anniversary of B Company TBS 1-67’s completion of its course. One side of the coin contains The Basic School emblem as it existed during our time there and the dates 5 July 1966 to 23 November 1966, and the words “50th Anniversary” to note our reunion. The reverse side features the Marine Corps emblem and the words: “United States Marine Corps”. The traditional practice is to place the coin in the hand of the recipient in the process of shaking hands to emphasize its significance. It is not “issued”, but given in recognition. In my career owing to the nature of my work, I was a recipient of many challenge coins. As discussion of our fifty-year reunion began, I gave serious thought to a challenge coin. This reunion is significant. 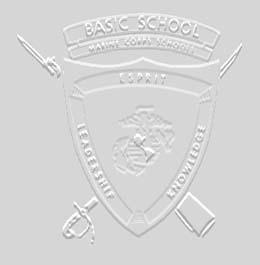 Had there been a fifty-year reunion occurring during our TBS days, it would have been of Marine officers who completed training in 1916. I suspect as students we would have been in awe of a class of that era. There are parallels. Marines in 1916 were not yet engaged in World War I, but likely it was on their minds. As was our case, they did not have long to wait; the first Marine contingent set sail from Quantico in June 1917. We can look back a half century and only remark how quickly time has passed. We did not envision how things would be in 2016 had we even thought that far into the future. I doubt any of us focused beyond the next two or three years and what they would bring as we continued and completed our training. Finally and in particular, the B Company TBS 1-67 coin is intended to honor and serve as a reminder of our company mates who died in training or combat or who later departed our company formation. May they rest in peace. Today there are many private manufacturers of pre-made challenge coins for individual purchase, such as SGT GRIT, NORTHWEST TERRITORIAL MINT, and SYMBOL ARTS. Price for each averages from twelve to twenty dollars. Because it was a volume purchase, our custom-designed reunion coin cost $8.00 each. I am not a collector, but may have a SGT. GRIT, NORTHWEST TERRITORIAL MINT, or SYMBOL ARTS coin somewhere. I will bring examples to the reunion to let all see the difference in quality. This is not to knock other manufacturers. The coins will speak for themselves.